A very important part of the outer trappings of a mummy was a mask, placed over the head to provide an idealized image of the deceased as a resurrected being. These masks were frequently fashioned from cartonnage, a cheap and lightweight material made from layers of linen stiffened with glue and plaster. The mask played a crucial symbolic role, for it signified the elevation of the dead person to a higher plane of existence in the afterlife. He or she was believed to attain a status of equality with the gods, and this association was conveyed in particular through the symbolic use of color and precious materials. 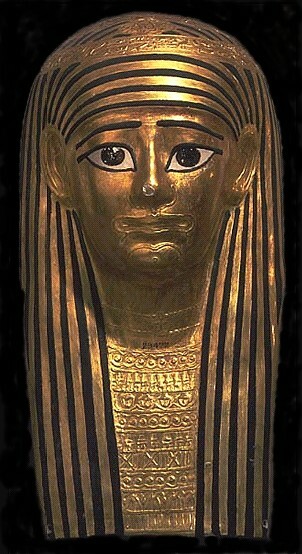 This mask exemplifies all the classic features of such funerary trappings. The face, collar and wig are extensively covered with gold leaf, and the wide-open eyes convey a sense of vitality and alertness appropriate to one who has entered upon a new life. It is, however, a purely idealized image and is in no sense a true likeness of the deceased.